Throughout the summer, we've been catching up with former Blues players to find out what they're up to after hockey. We recently caught up with Ryan Johnson, who played with the Blues from 2002 until 2008. Now with a fiancee and a five-month-old son, Johnson played in 289 career games in St. Louis, scoring 19 goals and 30 assists. As one of the League's most fearless shot blockers and penalty killers, Johnson put together an NHL career that lasted 701 games with Florida, Tampa Bay, St. Louis and Vancouver. STLOUISBLUES.COM: As a kid growing up in Thunder Bay, Ontario, we’re assuming the hockey bug bit you early. RYAN JOHNSON: Yeah, hockey up here is a religion. You get eight or nine months out of the year of good hockey weather, and it’s really just what you do up here. As soon as you can walk, you strap a pair of skates on and it just becomes part of your culture. BLUES: Your older brother was Greg Johnson, who also played in the NHL, correct? RJ: Yeah, my brother Greg is almost six years older than me and he played (in the NHL). My other brother, Corey, was five years older. He played, too. So I grew up emulating the two of them. As they made their progressions through their careers, it was easy for me to see what I wanted to do, which was everything they did. Thankfully for me, a lot of the trials and tribulations that they went through I was able to learn, so I had a formula in front of me, which not a lot of people have. Corey was a smart guy, a double major and could have went and played pro, but he had an incredible opportunity that was offered to him before he left school, so he couldn’t pass that up. BLUES: How big of a role did your parents play in how the three of you excelled as hockey players? RJ: My parents were my biggest role models and my father was very involved in the game from a young age. He often used his teaching of life skills through the game of hockey, so he wasn’t really making a point of ways we can improve ourselves in the game, but he was more teaching us about life through the game. We were very fortunate to have two great parents that gave us incredible opportunities. No member of the Blues was more dedicated to blocking shots than Ryan Johnson, who played in St. Louis from 2002-2008 (Getty Images). BLUES: You carved out a good niche in the NHL as a good energy guy, a good special teams guy and a big shot blocker. How did you find that as your ticket to the NHL? RJ: I think the biggest thing in making a step from junior or college, into the minors and into the NHL is to adapt. Everybody comes out of their junior or college careers as usually one of the better players on their team, and they’re always relied on to be a scorer. But as you get into trying to break into the League, I think you have to recognize that maybe you’re not going to be a Top-6 forward, so you add some other key components to your game to allow you to become an asset to the organization. That's how you find yourself not just playing in the NHL, but having a long career there. That’s what I did. In the minors, I worked on face-offs, tried to be the best penalty killer I could, the best two-way player I could. When I got to the NHL, although I had put up pretty good numbers in the minors, I was able to bring those things to the table that were recognized immediately and thankfully, I was able to have a long career. BLUES: How did you talk yourself into getting in front of all those shots that you blocked? RJ: It just because instinctual after awhile. On the penalty kill, it was just something that I felt added a huge part to my game. As much as a lot of people thought it seemed pretty radical, there always was an art to it as far as I was concerned. I took a lot of pride in it. BLUES: Can you describe your five seasons with the Blues, and when you think back on it, what stands out? RJ: It was absolutely unbelievable. It was such an incredible experience for me to play in a community like that. Going into it, I had always heard it had one of the highest return rates of Alumni that came back and lived in the city. When I got there and experienced the city itself and the first-class ways of the organization, I quickly realized why that was the case. I had some amazing experiences, met some amazing people, both the players I’ve played with and some incredible people around the community. I always have fond memories of my time in St. Louis and I miss not being able to spend more time there. BLUES: Do you still have friendships with some of your teammates in St. Louis? RJ: Yeah. Barret Jackman was a great friend of mine when I played there and still to this day is a very good friend of mine and he always will be. There has been quite a bit of change there but Eric Brewer and Jay McClement and guys like that are still great friends of mine. BLUES: As a former Blue, you’ve got to be excited to see the strides the team has made in the last few seasons. RJ: When I left St. Louis to go to Vancouver, unfortunately who did we meet in the first round of the playoffs? The Blues. And all my great friends were playing on the other side, and they were the hottest team in the NHL at the time. To have to go against them was by far the toughest playoff series that I have been involved in. The fact that we won four games was by no means representative of what that series was. At that point, you could see the veteran leadership and the youth that was developing, the future is very very bright for that organization. 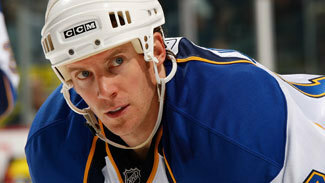 BLUES: Is it true you breed and race horses and own a few of them with Barret Jackman? RJ: Yeah, Barret has been involved in some of it. Since a young age, I’ve been a huge horse racing fan. I’m not a big better, I truly love the sport. I love being a part of the breeding side of it, seeing the pedigrees and still to this day, I’m a huge fan. I try to get to the Kentucky Derby and the Breeder’s Cup and a lot of the big races when I can. I know Barret has dabbled in it for fun as well and has gotten some of the other guys in St. Louis involved. It’s something that I’ll be a fan of for life, that’s for sure. BLUES: Have you named any horses, and if so, which is your favorite? RJ: I’ve named some interesting ones after my hometown and different things like that, but I guess that the horse that I’ll always remember the most is the one that I owned first. His name was Divide and Conquer. He won his first time out and he ran in some big stakes races out in California. BLUES: So now that you’ve finished your playing career, what’s next for you? RJ: I’ve been retired now for almost a year, and I really wanted to take a step back and assess what I want to throw myself into next. I’m a very busy-body. I need my mind to always be going or I drive myself crazy. I’ve been doing a lot of exploring with things both inside the game and outside. The game has been so good to me and I’ve been so fortunate to have the career that I’ve had that I want to give back to the game at some point, whether that’s being involved with an organization or other facets. There are areas in the game that I can help with players and being involved with younger players to teach them what it’s like to be a professional and develop not just into a player, but a person that understands the game and what it takes. We’ll see what happens, I’m exploring that all right now.